WASHINGTON — An Army staff sergeant who stepped into the line of fire to help a pair of comrades on the Afghan battlefield has been given a Medal of Honor, the nation's top military award. 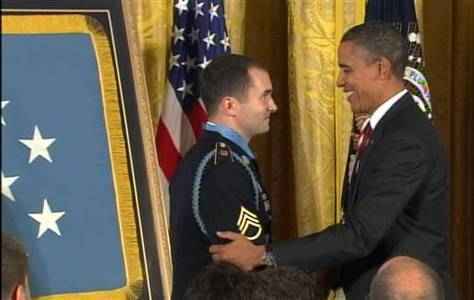 President Barack Obama awarded the medal to Salvatore Giunta (jee-UN'-tah) Tuesday. That makes the 25-year-old Iowan the first living service member from the Iraq or Afghanistan wars to be so honored. Seven others have received the award posthumously. Obama called Giunta a solider who is "as humble as he is heroic" and said the ceremony was a "joyous occasion." The Army says Giunta was a rifle team leader in eastern Afghanistan's Korengal Valley when his squad was split in two after an ambush by insurgents. 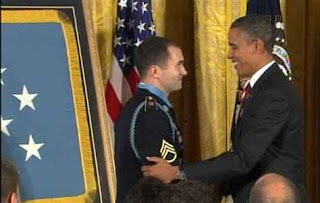 While under fire, Giunta pulled a fellow soldier to cover and rescued another who was being dragged away by the enemy.